Pocket Monsters Advanced Generation Minna de Pico Pokémon Waiwai Battle! Minna de Pico Pokémon Waiwai Battle! Pocket Monsters Advanced Generation Minna de Pico Pokémon Waiwai Battle! (ポケットモンスター アドバンスジェネレーション みんなでピコ ポケモンわいわいバトル!) 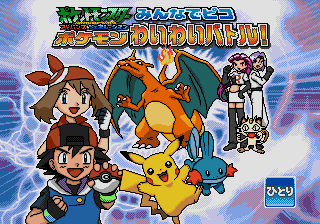 is a Sega Pico game based on the Pokémon series. It came with its own special controller.